Art has always been a way activists have communicated with the world. Just as AIDS activists did in the 1980s, the high school’s students are teaming up with the David Serko Project to use art to spread their own message about AIDS to the Vashon community. To honor Vashon’s celebration of World AIDS Day, students in John Rees’ Literature and the Elusive Now class and Kristen Dallum’s AP Studio Art class are working to create an art installation titled “Lost to Aids” to honor the AIDS activists of the 1980s. Peter Serko, founder of the David Serko Project, is spearheading the project, along with several other events occurring during the four-day celebration. Serko created the projects in hopes of better educating teenagers about the AIDS epidemic. The completed installation of “Lost to Aids” will consist of a wall built by Dallum with posters pasted onto it. The posters will be modeled after documents originally designed in the 1980s by AIDS activists themselves. Literature students will create cross-out poems, modifying posters from the original AIDS movement to create new poetry. While Rees’s students are focusing on showing the divisiveness created during the epidemic, Dallum’s class is taking on a different angle. 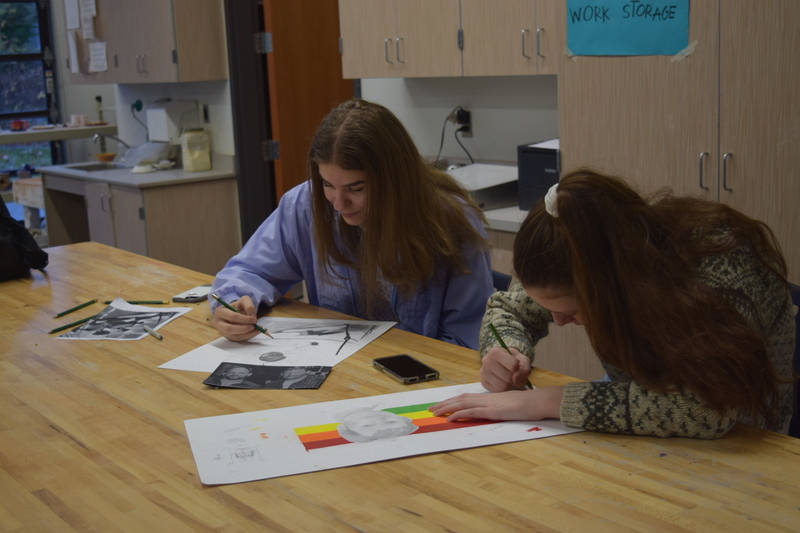 “Our class is creating a gallery experience to inform the visitors about the history of the AIDS crisis, as well as to honor the lives specifically of victims of the AIDS crisis who were from Vashon Island,” Dallum said. In order to honor those lost to the epidemic, Rayne Plauche, a senior in Dallum’s class, is using a political funeral as inspiration for her poster rendition. Despite the fact that the rate of increase has slowed down significantly since the 1990s, the number of people living with HIV globally reached its peak in 2015 at 36.7 million people and still poses as a very real threat. Although AIDS can be an uncomfortable subject for some, celebrating and acknowledging World AIDS Day can be a powerful and educational experience. The art installation Serko organized will be at Vashon Center for the Arts for the whole month of December, opening on November 29th at 6:00 pm. Afterward, it will be moved to the Vashon Maury Heritage Museum. To Serko, the benefits of the art installation are clear. Other events being held for World AIDS Day include We Remember: AIDS Oral History Project; Learning From AIDS: Stonewall to Border Wall Forum; “Crazy Little Thing Called Love: A Musical Tribute to Freddie Mercury”; and “A Normal Heart,” a play written during the early days of the epidemic. As communication in the ‘80s was largely limited to landline phone calls, activists turned to art as a way to interact with each other. Today, communication is simpler than ever before, but art is is still an influential part of our lives.